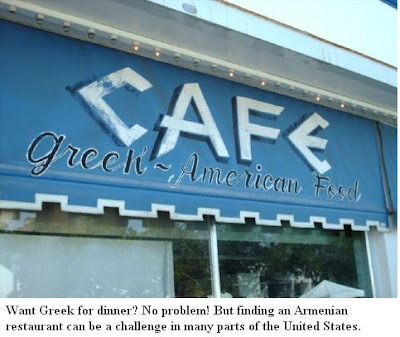 TheArmenianKitchen.com : Armenian restaurants: Where are they? My husband and I went to see the new Nia Vardalas movie My Life in Ruins with our friend Hap Erstein, who reviews movies for a living. The movie is set in Greece with its lovely scenery, aqua-blue water and white-washed buildings. Surprisingly, there weren't many scenes featuring Greek food - oh, that food! Hap insisted we have a Greek meal afterwards, because it was appropriate. We couldn’t disagree. There were at least 7 decent Greek eateries within 5 miles of the theater to choose from. There are Chinese, Mexican, Italian, Thai, Japanese, and Greek restaurants galore, with some Middle Eastern restaurants sprinkled in here and there. But, where are the Armenian restaurants? It’s very casual and tiny, with canopied seating overlooking the Atlantic Ocean. The view is spectacular, and the food is good, even though it has more of a Russian flair. But, hey, they do have luleh kebab and basturma on the menu, so we’re not complaining. If there are any other Armenian restaurants around, they are hiding from view. If any of you know of an Armenian restaurant in your area - wherever you live, TheArmenianKitchen.com would love to hear about it. Please e-mail me at robyn@thearmeniankitchen.com to share the name, location, and a description of your favorite menu item(s) to be posted at a later date. It’s time for everyone to experience the joy of Armenian food!